In Hinduism, Gurus are often equated to god and regarded as a link between the individual and the immortal. All disciples are entitled to gain from their guru's knowledge which would entitle their spirituality. The full moon day in the Hindu month of Ashad (July-August) is the auspicious day when Guru Purnima is celebrated to honor the memory of the great sage Vyasa. All Hindus are obliged to this ancient saint who edited the four Vedas, wrote 18 Puranas, the Mahabharata and the Srimad Bhagavata. On this day, all spiritual aspirants and devotees worship Vyasa perform a 'puja' of their respective spiritual preceptor or 'Gurudevs'. On this day, Guru is worshipped through the traditional procedures and his disciples and students worship their guru to obtain wisdom. Offerings are made to the guru according to their capability. Guru Dakshina can be anything from money and fruits to flowers and clothes. Gurus offer blessings when the offerings are made. This day is of deep significance to the farmers, for it indicates the arrival of rains and brings in fresh life in the fields. It is the ideal time to begin your spiritual lessons. Traditionally, spiritual seekers commence to concentrate on their spiritual 'sadhana' on this day. In the past, spiritual masters and their disciples who used to wander would settle down at a place, in order to study the Brahma Sutras composed by Vyasa, and engage themselves in Vedantic discussions. At the Sivananda Ashram, Rishikesh, the Guru Purnima is celebrated every year. 1. Aspirants wakes up 4 o'cloc, meditate on the Guru and chant his prayers. 2. The sacred worship of the Guru's Feet is performed in the later part of the day. 3. 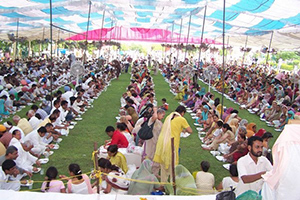 Sadhus and Sannyasees are worshipped and fed at noon. 4. 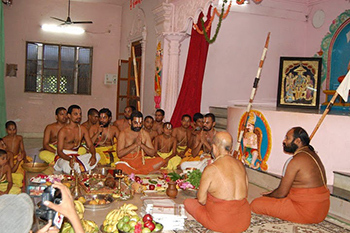 Deserving devotees are initiated into the Holy Order of Sannyas, as this day is a highly auspicious occasion. 5. Disciples fast and spend the whole day immersed in prayer. For those who hold Guru Poornima celebrations you can use online Guru Poornima invitations now through Yoovite.Com. There is a huge range of templates offered on the site and you can choose one from the list to design your invitations to the friends and family.